Mosquito foggers are the best and highly reliable option to get rid of mosquitoes, when you have extreme mosquito problem in your home, yard or garden. Choosing a good mosquito fogger is definitely not an easy task when you have many commercial mosquito fogger products out there in the market and claims that, it is the best mosquito fogger to kill the mosquitoes effectively than any other mosquito fogger. Hence, we have conducted an in-depth research and bring to you the most effective foggers for mosquitoes that are out there. These 6 Best fogger for mosquitoes works for both indoor and outdoor. What makes the Burgess 1443 the best mosquito fogger? The Burgess 1443 propane insect fogger is a heavy duty thermal fogger that has been introduced by the Fountainhead Group, Inc., a brand that has a rich 125 year history of creating high quality liquid applicator solutions. 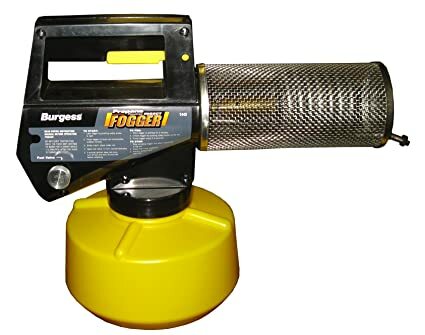 The burgess mosquito fogger is powered by propane gas and is compatible with both 14.1oz and 16.4oz standard propane cylinders. 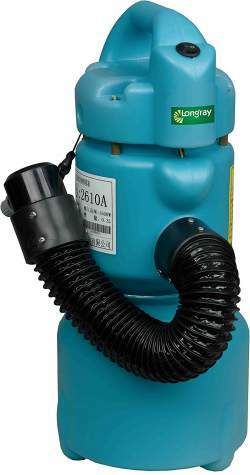 The liquid tank of this fogger is able to hold 40 ounces of insecticide and can be used for as long as 2 hours straight. It comes with a smart trigger lock that ensures there is no accidental dispersion of the insecticide. The dimension of Burgess Mosquito fogger is 17.52cm (L) x 39.37cm (W) x 28.44cm (H). It weighs 2.8 pounds (1.27 kg). Doesn't have an automatic ignition and has to be ignited using a lighter. The Silver Bullet ULV non-thermal cold fogger is one of the top ULV foggers in the market today. ULV stands for Ultra Low Volume droplets contained in the mist or fog caused by the fogger. These droplets can vary in diameter from 5-50 microns (μm) as compared to droplets of conventional sprayers as their size varies from 100-200 microns. This is one of the reasons why the Silver Bullet ULV non-thermal cold fogger is on this list of best mosquito fogger. 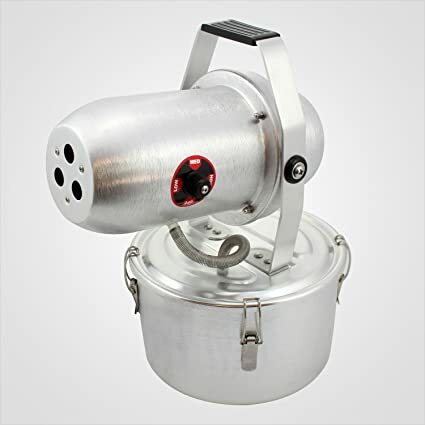 This triple jet pest, mold, and mosquito fogger, it has a strong and durable construction thanks to the lightweight and corrosion free stainless steel and aluminum, which also makes it easy to carry around and use. The Silver Bullet ULV non-thermal cold fogger has a powerful vacuum pump motor that allows the spray to reach almost 40 ft in a single burst. This Jet fogger has been created for both indoor and outdoor applications and can be used in food plants, greenhouses, hospitals, hotels, barns, farms, garden, and home. The non-thermal cold fogger has a one-turn control knob that aids in adjusting degree of misting and particle size. The Longray Carryall ULV fogger is definitely one of the best mosquito fogger in the market today. It is considered to be highly effective as it uses air pressure for producing ultra low volume particles of the liquid insecticide or pesticide that is being used for fogging, which is unlike thermal foggers where heat is used for vaporizing the fogging liquid solution. The ULV fogger has the ability to produce droplets that range from 5-30 microns in size. The Longray Carryall ULV fogger comes bundled in a 24 inch flex-hose. It is available with 18 month warranty. This tool works on electricity used for powering the encased electric motor. The motor helps in pumping the insecticide solution and enables spraying at a high air pressure through the existing nozzle. The Longray Carryall ULV fogger has a relatively big 1.6 gallon (6 liter) tank as compared to standard propane foggers. This ULV fogger repels and kills mosquitoes as well as mites, bed bugs, fleas, fruit flies, lice, and other insects. The fogger can be used indoors and outdoors. It can be used for реѕt control in the home, garden, vegetable garden in the сity, grееnhоuѕе, hоѕрitаlѕ, ѕtаdium, bus stations, раѕѕеngеr trаinѕ, thеаtеr, and wаrеhоuѕеѕ. If you are annoyed and irritated with mosquitoes and other flying insects in your garden then it is time to bring home the Repel propane insect and mosquito fogger. It is definitely one of the best mosquito foggers that you can lay your hands on. This Propane powered fogging machine is completely portable and has been designed for use in the outdoor space like campsites and garden area. The Repel Propane Insect Fogger is compatible with 14.1 oz. as well as 16.4 oz. propane cylinders, which are sold separately. This is quite a handy tool to get rid of mosquitoes just about anywhere and can be used by just about anyone. 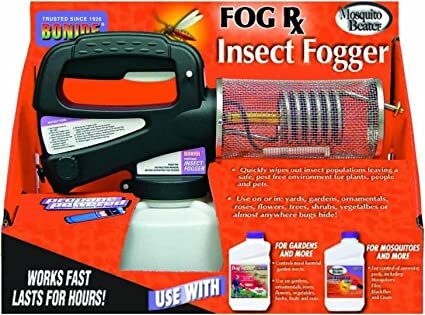 This mosquito fogger tool is easy to work with and has an auto start button that helps in warming up the tool in a few minutes and once the trigger is pumped, the fog automatically exits in the form of a fine spray. The propane insect fogger is highly effective on mosquitoes especially the ones that are known to carry the West Nile virus or Zika virus. It kills mosquitoes on contact. 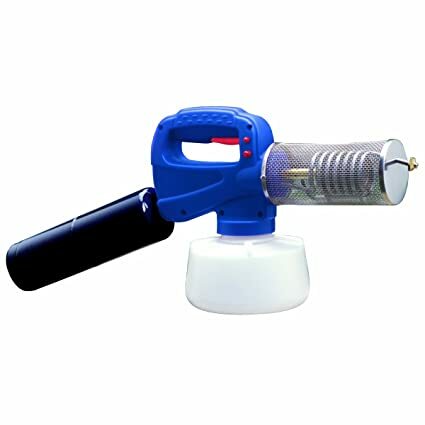 This handheld propane fogger effectively kills biting flies and other insects as well and provides protection for almost 6 hours after initial spraying. In the world of propane foggers, the Bonide 420 Fog-Rx propane insect fogger stands out like the king. It is a thermal fogger that is available with an auto ignite button and is equipped with a 40oz or 1.18 liter insecticide container that allows fogging of a larger area. This is one of the reasons it has been featured on the best mosquito fogger list. The Bonide 420 Fog-Rx propane insect fogger uses propane gas for heating the coil. The product is available with a 90 days warranty on defects in materials and workmanship. The mosquito fogger has been made using durable nylon plastic and as a result, it is highly lightweight. It is a portable device manufactured by Bonide Products Inc. and is compatible with a 14.1 oz propane cylinder. The Bonide 420 Fog-Rx propane insect fogger is highly effective on mosquitoes. It can effectively repel and kill other flying insects including gnats, flies, and moths. It is recommended for outdoor use only and can be used at picnic spots, outdoor gardens, camp sites, backyard, farms or ranches etc. The device comes with a trigger lock button that prevents accidental spraying of the insecticide solution. 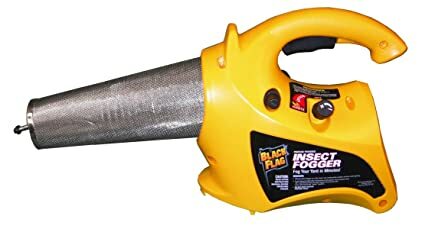 Black Flag 190107 electric insect fogger comes from a brand that came out with its first insect control product in 1833. Since then there has been no turning back and that is why it is on the best mosquito fogger list. The electric insect fogger is a whole new ball game altogether. It is a thermal fogger that uses heat for vaporizing the insecticide solution, which is then sprayed out. The Black Flag electric insect fogger uses electricity for heating the heat barrel assembly. It comes with a 1 year warranty. The body parts have been made using plastic and as a result it is extremely light weight. It is equipped with a 40oz or 1.18 liter insecticide container that allows fogging of a larger area. The tool comes with a trigger lock button, which can be used for lock the fogging trigger and ensure there is no accidental spraying of the insecticide solution.